1. The Democrats’ enthusiasm advantage: From Kansas and South Carolina to Virginia and Alabama, Democrats — win or lose — have overperformed in most of the major races over the past year in the Trump Era. 2. Scandal isn’t helping the GOP: The reason there’s a PA-18 special election in the first place is due to the resignation of anti-abortion Rep. Tim Murphy, R-Pa., who left his seat after allegedly encouraged his lover to terminate her pregnancy. "You guys can decide why the stakes are high nationally," Lamb said, per NBC’s Alex Seitz-Wald. "I think for our people, they feel very let down by people like Tim Murphy, who were hypocrites." And remember, parties that have to defend a seat vacated as a result of scandal typically have a hard time — see Democrats who lost Anthony Weiner’s congressional seat in 2011. 3. Lamb is viewed as the better candidate: Democrat Conor Lamb has outraised and outspent Republican Rick Saccone over the airwaves (although GOP outside groups have more than made up the gap). On the ground, NBC’s Seitz-Wald has noticed a lack of energy coming from the Saccone campaign. 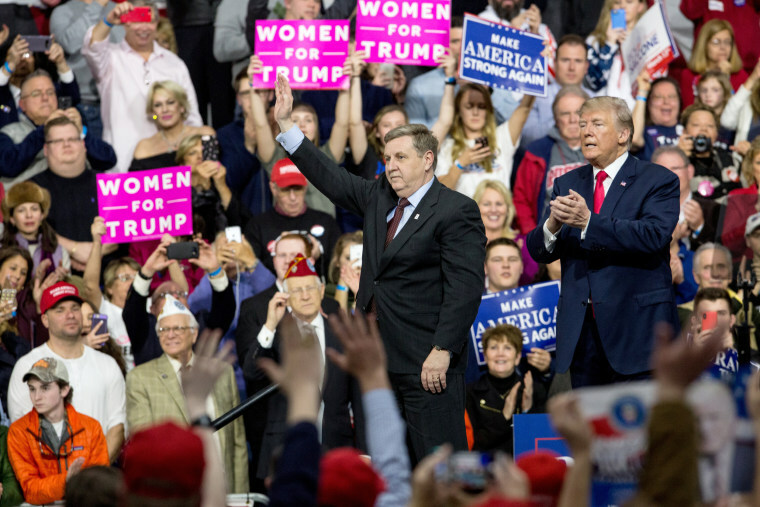 “Have never been to a political event quite as low energy as Rick Saccone's ‘GOTV Rally’ Friday night. No more than 2 dozen volunteers, many from out-of-state, who complained the locals were unenthused,” he tweeted. And even Republicans have admitted that Lamb is the superior candidate. “Candidate quality matters, and when one candidate outraises the other 5-to-1, that creates real challenges for outside groups trying to win a race,” GOP strategist Corry Bliss told Politico. Add them all up — Democratic enthusiasm, GOP scandal and a superior Dem candidate — and you see why this race is so close, even in Trump Country. By the way, those same three features defined last December’s Alabama Senate race, and we saw how that race turned out. Then, on “Meet the Press,” retiring Sen. Jeff Flake, R-Ariz., said that a Republican needs to primary Trump in 2020. TODD: Do you think [Trump] needs to be challenged from somebody who espouses your views?FLAKE: Yes, I do. I do. I mean, it would be a tough go in a Republican primary. The Republican Party is the Trump party right now. But that's not to say it will stay that way. And also on “Meet” yesterday, Sen. Elizabeth Warren, D-Mass., wouldn’t answer the question if she would serve a full term if she wins re-election in November. TODD: If you win reelection this year are you going to pledge to serve a full six year term?WARREN: So look, I am not running for president of the United States. I am running for the United States Senate. 2018. Massachusetts. Whoohoo...TODD: I take it as a no you're not pledging to serve your full six year term if you win reelection?WARREN: I already told you. I have no intention of running for the United States — for president. Why is Trump trying to make a nuclear deal with North Korea but kill the one with Iran? It was exactly one week ago when former Trump aide Sam Nunberg made those multiple TV appearances, initially saying he would defy special counsel Robert Mueller. And here he was yesterday, telling MSNBC’s Alex Witt that he answered all of Mueller’s questions. WITT: Did you refuse to answer any questions?NUNBERG: Absolutely not. I don't refuse to answer any questions. What I say is, ‘I dont know.’ And there weren’t many incidences of that.